As Norwegian voters head into election booths to cast their ballots, state officials have already been working for months to ensure the highest possible security around their choices for Parliament. Some of the security measures now in place may cause some delays in election results early next week, but that’s a risk the officials are willing to take. “We’ll just have to use the time it takes to count up all the ballots,” one local official told Norwegian Broadcasting (NRK) just after being told on Friday that all municipalities must conduct at least one manual count of all absentee and early voting and those ballots cast on Election Day next Monday. Instead of simply feeding ballots into scanners attached to the Internet, people will also count the votes. The manual count was ordered by the government minister in charge of elections, Jan Tore Sanner, in cooperation with the national security agency NSM (Nasjonal sikkerhetsmyndighet) and the state police intelligence agency PST (Politiets sikkerhetstjeneste). 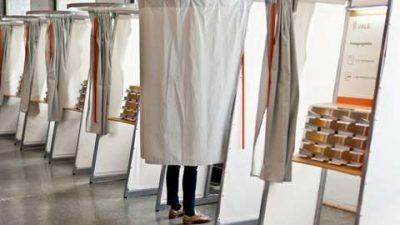 Sanner’s order came after some computer experts expressed concern about the scanning system used to interpret and count how many people have voted for Norway’s various parties. Its Internet connection sparked the worries about vulnerability to hacking. Rattled by all the speculation around the US election, and whether it was influenced by Russian hackers, Norwegian politicians and bureaucrats have been paying much more attention to security. So have the parties themselves, with candidates for Parliament receiving instructions and guidelines for avoiding cyber attacks on their email and websites. They all received written warnings about how to keep track of their smart phones, laptops and tablets, to be wary of memory sticks, links and any attachments to mail they may receive. “You have to take care of your devices in the same way as you take care of your wallet or passport,” Sanner told newspaper Aftenposten earlier this year. Politicians have also been advised to be extra careful with their log-ins and to use encrypted communication. They were also advised to be especially careful with foreign diplomats “who can try to get to know you” through pleasant and natural meetings. “Later on, those relations can be exploited in a negative manner,” read a brochure delivered to all candidates for Parliament that was put together by Sanner’s ministry in cooperation with the Justice Ministry. Russia and China have been viewed as the largest potential threats to election security in Norway, according to both NSM and PST. Justice Minister Per-Willy Amundsen has said he thinks consciousness of security needs has been “quite high” among candidates for Parliament. Now the municipalities that only used electronic vote tallies will also count votes manually. All ballots must be counted three times, under Norwegian election law.